Conspiracy theories are everywhere. Books, TV shows, films, documentaries, magazines, newspapers – you almost can’t help being exposed to some form of conspiracy theory on a daily basis. And then there’s the internet. Millions of websites and vast, thriving communities exist purely to discuss conspiracy theories. Some of these theories are believed only by a handful of people, some are embarrassing even to other conspiracy theorists. But some have broken through into the mainstream to such an extent that they are an established part of the cultural landscape; according to some polls more people believe the J.F.K. assassination conspiracy theory than than ‘lone gunman’ theory. Can all those people be wrong? I can’t know for sure what did or didn’t happen on the grassy knoll, but psychological research reveals that people – normal, intelligent, rational people – can come to fervently believe things which aren’t well supported, and may even be contradicted by the evidence. There are a whole host of social factors, personality traits, cognitive biases and heuristics, which can all contribute to belief formation. Sometimes the beliefs they lead to are reasonable, or at least useful. Sometimes not. This blog is going to be about what psychology can tell us about how people come to believe conspiracy theories. If you arrived here looking for evidence for or against particular conspiracy theories you might be disappointed. The goal here isn’t to definitively prove or disprove the reality of any particular conspiracy; rather, it’s about the sometimes surprising psychology of belief. 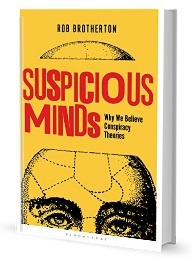 My hope is that regardless of your existing beliefs about conspiracy theories, you will read the information here with an open mind and think about how you arrived at your own set of beliefs about the world. This entry was posted in Meta and tagged psychology. Bookmark the permalink. This webpage is long overdue, and thanks for putting it together. I’m sure you have already been deluged by letters saying you are just covering up for THEM. You talking about giant ants in the sewer system of LA? I think the army took them out in the 1950’s.